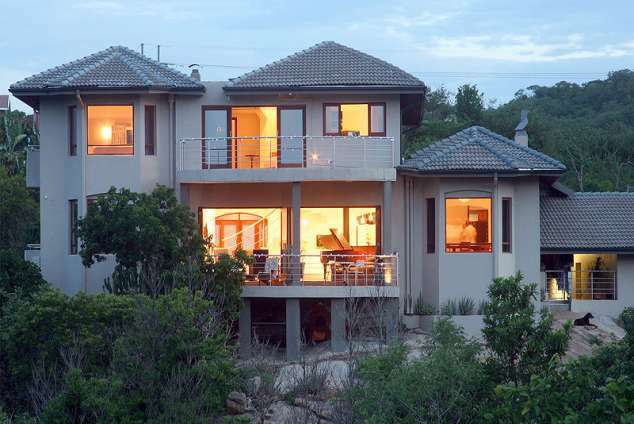 Leaves Lodge and Spa - Nelspruit Accommodation. Come and experience this stylish 5 star guesthouse in Nelspruit. Built on a granite dome you can enjoy breath-taking views from the main lodge over the indigenous forest and a murmuring mountain stream that runs through the lush garden. The lodge is located in a quiet suburb and borders the nature reserve on both sides of the tar road. This impressive lodge exemplifies the very best in modern architecture and offers self-catering, presidential suites, superior and luxury rooms, with extra-long beds, private balconies or garden views, DSTV, air-conditioning, mini bars, high speed Wi-Fi, and much more. There is 24hour security with CCTV camera monitoring, and alarmed response. The spa is equipped with a unique outdoor treatment deck, double treatment suites, an outdoor hydro jet pool, a heated pool with deck overlooking the nature reserve. Advanced skin and body treatments are offered by professionally qualified therapists. The stylish and private conference centre, seats 15- 30 delegates, depending on the configuration. The lodge is ideally situated near the CBD, Medi Clinic hospital, restaurants, shopping centres, and the Kruger Mpumalanga International Airport. A short drive will bring you to the world famous Kruger National Park, the Blyde River Canyon, Pilgrims Rest, Barberton, Forever Resorts, Jane Goodall Chimpanzee Sanctuary, Swaziland and Maputo. Detail description : Leaves Lodge and Spa border on the Nelspruit Nature Reserve with no fences deviding the lodge from the reserve allowing walks along the river through the reserve. 28682 page views since 30 Oct, 2007. Last updated on 14 Nov, 2018.